My new book, Burned, comes out today. One of my favorite parts of writing nonfiction is the opportunity to unravel a mystery while immersing in the worlds of the people and subjects I tackle. During the past two years I’ve attended arson school and learned from real-life CSI and fire experts at the top of their game. And I took a deep dive inside the world of the most unique criminal law practice I’ve ever encountered: the California Innocence Project. In the bowels of a San Diego law school, the project’s lawyers, volunteers and students sift through an ever-growing mountain of letters from men and women convicted of terrible crimes. Buried in this flood are a slim number of cases where justice went awry. That’s how I encountered Jo Ann Parks, convicted of a triple murder and sentenced to life in prison without possibility of parole. A Los Angeles jury found Parks guilty of trapping her children inside her house, then setting it aflame. Since that terrible night thirty years ago there has been a revolution in the science of fire. Much of what was thought to be gospel in 1989 has been revealed to be myth and guesswork disguised as science. The California Innocence Projects reinvestigated the case and argues Parks should go free. It’s always a thrill when a new book comes out. But this story also marks my return to crime writing, which started when I was a newspaper reporter covering the courthouse and continued with my first five books. It’s been a while since I wrote Mississippi Mud and No Matter How Loud I Shout: A Year in the Life of Juvenile Court, though they remain two of my best-selling books. 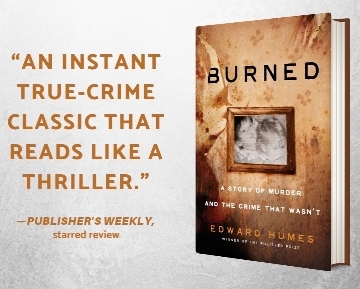 When I came across the stories behind Burned, I knew it was time to return to the true-crime book world I love. Speaking of Mississippi Mud, I received some exciting news recently: the movie version of this tale of murder, the Dixie Mafia, and a daughter’s search for justice is moving forward in 2019! Stay tuned for more on that. It’s not all crime all the time for me, though. These days I split my time and work between Seattle and Southern California. It’s also been another great year for Garbology: Our Dirty Love Affair With Trash, which so far has been adopted for 24 community or campus reads, from Ranchos Palos Verdes in California to the city of Portland to the Georgia Institute of Technology. This year I talked trash at Purdue University in Indiana and The College of Wooster in Ohio, where every freshman read Garbology and did projects related to waste and the environment throughout the school year. Finally, a note of thanks: I appreciate everyone who has taken the time to send me a letter or email this year, to comment on something I’ve written, to make a timely suggestion, or to point out a story, event or insight I otherwise would have missed. My readers are the best! I can’t thank you enough for taking an interest in my work. My favorite crime books — fiction and nonfiction alike — hook readers with more than a compelling plot and mystery. They also develop a deep and atmospheric sense of place. Think John Berendt’s Savannah in “Midnight in the Garden of Good and Evil,” or Raymond Chandler’s noir Los Angeles in any of his Philip Marlowe books. As a setting, I’m fascinated by the city of Nashville, and so I can’t resist “Monster City: Murder, Music and Mayhem in Nashville’s Dark Age,” Michael Arntfield’s nonfiction account of multiple serial killers stalking the nation’s country-music capital. On the crime fiction front, I’ll be picking up Michael Connelly’s latest Harry Bosch mystery, Dark Sacred Night, when it comes out the day before Halloween. I love the setting for this one: Bosch returns to his old Hollywood stomping grounds in the company of the lead character of Connelly’s other detective series, Renée Ballard. Janet Maslin’s review of Joe Ide’s third book, “Wrecked,” made me want to dive into Ide’s world. But obsessive as I am, I have to go back and read his first two books first, starting with “IQ.” I can’t wait to see what he does with the setting of East Long Beach — my own home-base when I first moved to Southern California. Speaking of obsession, I have been speeding through the Walt Longmire series of books by Craig Johnson, with their beautifully rendered portraits of Wyoming life and landscape. I have a dozen books to go before I reach Johnson’s newest installment, “Depth of Winter.” Right now I’m on the fifth, “The Dark Horse,” which I’m listening to in the Audible version, expertly narrated by George Guidall, speaking just how you’d expect Walt would sound if he was kicking back on his porch with you and a couple of ice-cold Rainiers. Imagine you’re a lawyer with 12 clients in prison you believe to be innocent. How do you get a busy governor to pay attention to your pleas for clemency? If you’re Justin Brooks, Director of the California Innocence Project in San Diego, you battle in court, you tweet Gov. Jerry Brown daily, and when that fails, you walk. Really, really far. His team has already won freedom for five of them in the courts. A bid to overturn a sixth’s murder conviction awaits a Los Angeles judge’s decision: the case of Jo Ann Parks, chronicled in my upcoming book, Burned. New evidence in the arson-murder case against Parks could set her free, although prosecutors are fighting hard to prove she deserves her life-without-parole sentence. So Brooks is simultaneously needling the governor to grant parole or commutation to her, along with the other members of the California 12 still behind bars. This is not the first time Brooks has let his feet do the talking: Five years ago, he led his staff on a 712-mile trek from San Diego to Sacramento to introduce the California 12 to the world. I’m getting ready to visit the College of Wooster, where the freshmen class is reading Garbology. I’m already so inspired by the ways students there are challenging themselves to be less trashy. Check out this great video, where a Wooster student named MacKenzie explains how she made her love of coffee less wasteful with reusable mugs and a reusable capsule for her single-cup coffee maker. This even saves her money! Robert, meanwhile, says he is avoiding all food packaged in plastic. Emma has ended her addiction to plastic water bottles. I can’t wait to see what other ideas and questions the Wooster students come up with when I visit their Ohio campus on September 26-27. I love it when Garbology readers reach out to share ways they are being less wasteful — everything from participating in beach cleanups, to composting table scraps, to buying used things whenever possible. One Purdue University Northwest student told me how she created a Bag Monster costume out of hundreds of plastic bags. She it wears it on campus and at community events to raise awareness about the dire effect plastic waste is having on the world’s oceans. So I’ve started keeping a list of great suggestions from readers who reuse, reduce, recycle, and refuse unwanted items. I’ll be posting the list on my site later this fall and I welcome your trashy suggestions and photos, too. Send me a message at ehumes@edwardhumes.com and I’ll add your suggestions to the list! Will New Science Set a Mother Free After 26 Years in Prison? I’ve been away for a while, immersed in my next book. But I’m back now, and eager to tell you about Burned, which will be published by Dutton Books in January. soon decided that Parks had sabotaged wiring, set several fires herself, and even barricaded her four-year-old son inside a closet to make sure he could not escape the flames. The prosecutor on the case pronounced Parks one of the most monstrous killers in Los Angeles history, motivated by a desire to be free of parental responsibilities and eager to cash in by suing her landlords. Convicted through the power of forensic fire science, Parks remains in prison to this day, sentenced to life without possibility of parole. More than a quarter century later, however, there has been a revolution in the science of fire. Much of what was thought to be gospel in 1989 has been revealed to be myth and guesswork disguised as science. Now the Parks case has been reopened and re-investigated, the subject of an intense legal battle stretching over ten months in Los Angeles County Superior Court. Lawyers at the California Innocence Project hope to prove that false assumptions, tunnel vision and outright bias turned a terrible accident into a wrongful murder conviction. Parks, they say, has spent more than half her life in prison for a crime that never happened. Will Jo Ann Parks be exonerated? Should she be? Is she “Patient Zero” in an epidemic of wrongful arson convictions waiting to be overturned? Or can prosecutors come up with enough evidence from the ashes to make sure she dies in prison? No matter how this case turns out, someone will be left burned. This is my first true crime book in a while. I’m jazzed to be returning to the genre that started my career, with a murder mystery and tale of possible injustice that keeps you guessing until the very end. Stay tuned for more…. Read an excerpt of Burned here. Did you know your morning coffee travels 30,000 miles to reach your cup— more than enough to circle the globe? That the parts of your smartphone journey 160,000 miles just to reach your pocket? Or that the average car makes the equivalent of a round trip to the moon before your first test drive? And go ahead, add another 100,000 miles for each tank of gas you buy, an oily cocktail from four states and fourteen foreign countries to a pump near you. Such complex, meandering journeys lie behind nearly all we buy, eat, wear and touch—millions of miles embedded in every trip we take and every click we make. It’s a modern miracle. And absolute madness. All rolled in one. Welcome to the world of Door to Door, my transportation detective story, which has just arrived in a new paperback edition. With Door to Door, I wanted to explore a vast and seemingly impenetrable story by bringing it home—literally. I simply looked inside my closet and sock drawer, my kitchen and garage, and asked the most basic of questions: How do the things I use every day get here? What does it take to a keep a modern American family fed and clothed and on the move? Who are the heroes and villains in our have-it-now economy, what are the techno-wonders that make it happen, and what are the hidden costs behind the global sourcing of… everything? The answers blew me away. I’ll never look at my car or my cup of coffee in quite the same way. I’d love to hear what you think. Come take a ride with me and with Door to Door: The Magnificent, Maddening, Mysterious World of Transportation. The paperback edition is now available at a variety of booksellers. You can buy a copy of Door to Door at your favorite bookseller here. It's also available as an audiobook—perfect for commuting!